1 of 1 Combine basil leaves, olive oil, vinegar, salt and pepper in a blender or mini chopper. While blender is running, add 1/3 cup water. Continue blending until fairly smooth. Place chicken in a glass dish and add contents of blender. Let stand while heating grill. 1 of 3 Divide thawed dough in half. Roll each half on a lightly floured surface to a 9-inch circle. Let rest. 2 of 3 Heat gas grill to medium-high or coals in charcoal grill to medium hot. Grill chicken for 15 minutes or until cooked through, turning once. Remove to a cutting board and slice into bite-size pieces. 3 of 3 Brush pizza doughs with some of the olive oil. Transfer doughs, oil-side down, onto grill. Brush dough tops with olive oil. Cover and grill 3 minutes. Using tongs and a spatula, flip over doughs. Working quickly, spread 1/4 cup pizza sauce on each pie. Top with mozzarella. Cover and grill 2 minutes. Uncover and divide grilled chicken between pies. Grill 1 minute. 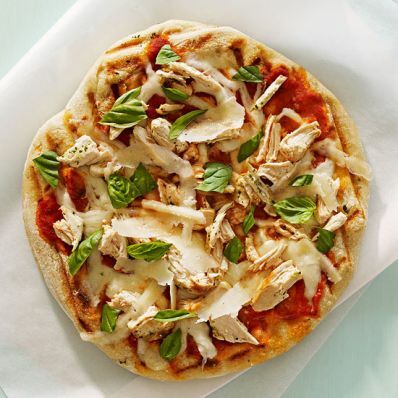 Remove pizzas to cutting board and top with grated cheese and fresh basil and serve. Per Serving: 1 g fiber, 16 g Fat, total, 680 mg sodium, 75 mg chol., 6 g sat. fat, 35 g carb., 401 kcal cal., 32 g pro.